What If I Only Bought Books Just Before I Read Them? I’ve always bought books far faster than I could ever read them. That’s always been true for physical books, and it’s even truer for audio books and ebooks. I just can’t pass up a bargain, like Audible.com’s recent sale that priced hundreds of audio books at $4.95 each. I bought 10 and I’m thinking about buying more, even though I have 60-80 audio books I haven’t listened to yet because of previous sales. Now my Kindle is filling up full of ebooks waiting to be read. Amazon has been offering 100 ebooks each month for $3.99 or less. Plus Books on the Knob keeps me informed of a constant stream of free ebooks and ebooks at bargain prices. And SFSignal announces almost daily free SF/F/H ebooks to try. There are so many free ebooks deals out there, and not just crappy books, but books worth reading, that it would be possible to never buy another book again. I already own more books than I have time to read even if I lived to be 100. I’m a book addict. I know why writers and publishers give away ebooks. They want exposure. New writers wants readers. I’ve read blogs by new writers who say when they price their books free hundreds and even thousands of them get downloaded. Of course, they also say, when the put a price back on the books, the downloads slow to a trickle, but that trickle is more sales than they got before they offered their books for free for a few days. Even established writers offer some of their books for free hoping to get attention for their other books. I’ve yet to read any of the free ebooks I’ve collected. And I’ve only read a handful of the bargain priced ebooks. And I wonder if I’m typical? Does free ebooks just inspire a kind of hoarding and not reading? If I was practical I’d only buy a book just before I was ready to start reading it. Now this is like believing I’m only going to eat food that’s good for me, but it is quite logical. Even if books were $50 each I would save a tremendous amount of money if I only bought books I actually read. What if all readers actually followed through on this practically plan of book buying? What percentage of book sales go to unread books? What percentage free books get read? Maybe I just like shopping for books. Maybe I just like reading book reviews. Maybe I could find a way to collect books I want to read but probably won’t, without buying them. I’m in a book club and I made up a list of potential books to read and found that very enjoyable. I even like rereading the list. I could build a virtual library of the books I think I want to read. Growing up I wanted to own a bookstore. Maybe that’s why I hoard books. 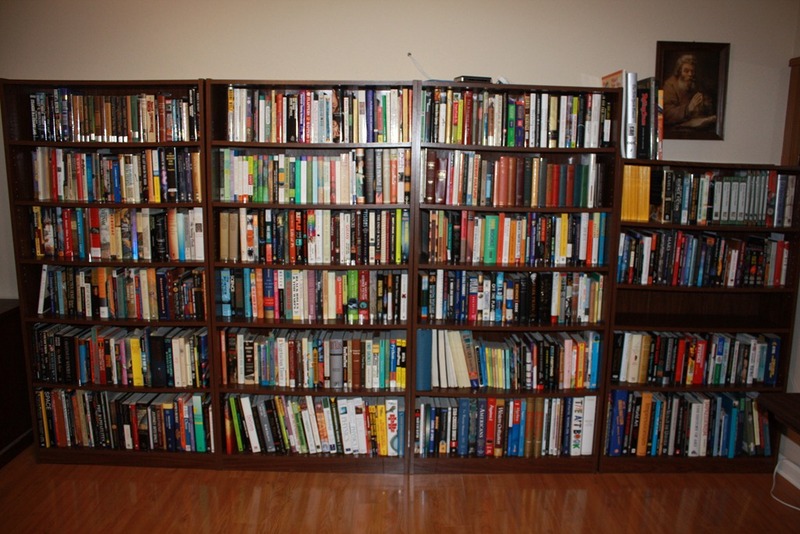 I also worked in a library for years – that could also explain my instinct to collect books. If I bought books only just before I read them would I feel the need to collect them afterwards? If I become just a reader can I divorce myself from my collecting instincts? Also, if I bought books just before I read them how would that change my life? I’d have more money and time, but what about the subtle changes? I spend a lot of time shopping for books, reading reviews, looking for bargains. There’s a table at my work we’ve designated as the free book table and people bring in books they want to give away and leave them on the table. I’m all the time looking through those books, often taking many, but seldom reading them. My public library has a used bookstore within the library that I like to visit too. I guess if I spent less time shopping for books I could actually read more. And I’d spend less time pouring over online sales and book catalogs. All of this sounds very practical and positive, but I don’t know if I can give up my book hoarding addiction. Prior to the last year or so I was an analog book only person. I didn’t have any way to read eBooks. Or at least any way that I thought was convenient. I probably had on the order of 1500 books and a few summers ago I got rid of them all except for a select few authors. And then I put myself on a buying moratorium for books. Then last February I got a “smart” phone and I installed the Kindle App and started the buying a book, then reading it, then buying a new one, and then reading it tactic. That lasted a little awhile until I started paying close attention to the deals Amazon was having. And I’m not talking about deals on unknown/little known authors. I’m talking about Hugo or Nebula or Stoker award winning novels. Big name authors. Free ebooks, one cent ebooks, 99 cent ebooks, etc. I started going a little crazy. Over Christmas my girlfriend got me a Kindle Touch and I’m about up to a little over 250 books in my Kindle library. Except for The End of Eternity by Isaac Asimov (which I really, really wanted to read) I don’t think I’ve paid more than $4.99 for any of them. At this point I’ve basically just set a threshold for myself of around $3.99 and if the book isn’t in that range I don’t bother buying it. Just doing some quick calculations puts me in the ball park of around $500 spent on eBooks in the past year for about 250 titles. So I’m averaging about $2 each. Of those I’ve read around 40. I’m sort of now at the point of having so many unread books on my Kindle that I’ve been scaling back on the buying. Unless its a spectacularly good price or a spectacularly wanted title I’ll be in a low-buying mode for awhile. As far as keeping tabs on things, I have two lists on Amazon, one for Kindle books by female authors i want to read and one for Kindle books for male authors. I imported both of those lists in to eReaderIQ.com and it sends me an e-mail when anything drops in price. I do peruse Amazon’s monthly 100 books for 3.99 deals too. That’s about it. When it comes to books and music in the last couple of years I realized I spent more time looking for, collecting, curating, books and music then I was actually listening or reading. I consciously decided that I’d much rather listen to and enjoy music, and read and enjoy books, then the overhead that was caused by my “collecting” either of them. Dan, one of my favorite reading periods in my life was when I first joined Audible.com and got 2 credits a month. I listened to each book before I got another one, and I loved taking the time to pick out just the one I wanted. Then Audible started having sales and I squirreled away a huge backlog of books. I wish I could get back to that way of reading again, where I spent a few hours just deciding what I wanted to read next. It makes reading so much more fun. We are just too rich in books. When I was a kid getting a book or album was something special. Hell, my mother only let me and my sister eat two cookies at a time. I grew up and started making money and I ate cookies by the bag and bought all the books and records I wanted. I guess I need some good old fashioned Puritanical self-control. The Kindle touch is a sweet device. I got one for my wife for Christmas. Amazon does maintain a list of all our books in our library, but it’s a boring text listing. I wish they’d make our virtual library into a snazzy visual site so I could enjoy paging through the book covers so it would feel like my Kindle library was like a physical book library and I could look at and admire my growing collection. If you have have 250 titles already then you have quite a virtual library. Is it all classic SF? Last month Amazon had The Door Into Summer by Heinlein for $2.99. I already own it in hardback and audio, but my hoarding instinct almost convinced me to buy a third copy. I suffer the addiction to book hoarding too. When I was a kid, my father had a bookstore, and the books I wanted were always too few and went away too fast. A short time ago I realized i don’t buy books but the illusion I’ll have the time to read them. Soon I’ll need a new hard drive to store my collection. That explains my situation exactly, buying books provides the illusion I’ve read them. I wish that was true. Imagine buying a book, and suddenly knowing everything that’s in the book. Wouldn’t that be cool?!! Gee, i don’t want to go so far as to say hoarding but I have a lot of books I haven’t gotten to yet. And if I didn’t buy anymore I’d still have enough reading material to last until I am at least 100. I do my best to avoid places that sell books when I go out. I love books. And I want the paper kind. Every few years I have to thin out my collection so it will fit my bookcases. I have friends that just buy more bookcases. My college roommate had so many books his girlfriends were afraid his bookshelves would collapse and crush them. I keep my hoarding under control by limiting myself to four bookcases. I always buy books I’m going to read one day. Mostly they get used to change the way my bookcases look. Up until a few years ago I’d never culled my book collection but I’ve started removing and rearranging a few of them and have realised that books make a terrific decorating feature, as well as a source of information and enjoyment. My purchases of print book have slowed right down since I use my Kindle more and more. I only have a few ebooks I haven’t finished reading. I find it easier to only buy ebooks I know I’m going to read. I think that’s because when I go into a book shop, I browse and end up buying books that look like fun. When I go shopping for ebooks, I go looking for specific books. My ebook collection has been corrupted by free ebooks. I have to really restrain myself from snapping up every interesting free ebook I see. If my wife would let me put bookshelves in the living room I’d have collected twice as many books. But she doesn’t think they’re good decoration. I haven’t spent much time on it but I’ve looked at some free ebook sites, read some reviews and some excerpts and decided, generally, I’m better off buying books I know I’ll read. I might be looking in the wrong places but the free books I’ve found are free for a reason – I wouldn’t pay money for them. Every once in a while the free book will be a keeper, like I got a collection of Greg Egan short stories free. And, I would like to assume that some of these new writers giving away their books might be the next Heinlein. The best deal might be the free books at Baen.com where they often give away the first books in a series by established writers, or some very old classics. And some publishers give away books for special promotions. I got The Windup Girl for free when it was up for awards. Free ebooks can fill up your Kindle with unreadable books easily, but it is possible to find a few gems. Well, if you can’t give it up you are certainly in good company. We are all of we addicts, are we not? I would love to know what percentage of purchased books lie unread in any given year. As a survey of one I would say the percentage is pretty high. You mentioned $50. Heck, even if books were closer to $100 apiece I might save quite a bit of money if I stuck to what I have and then only bought what I was going to read right then. I actually thought about using the $100 figure but then figured people would balk at that idea. But you’re right, it’s probably true. I’m sure I often spend $100 on books before reading one. For example, Audible.com has had several sales lately where I’ve spent a couple hundred bucks, but I’ve only listened to a couple of the sale books so far. By the way, I do my best with audio books. I listen to about 48 a year, but I only read 4-5 physical books or ebooks. I wonder Carl, how many book hoarders are like us? And if we starting only buying books we actual read would that seriously hurt the publishing industry? I think if Americans (lets just stick to our country for the moment) applied the “buy only what we are going to use” philosophy that it would possibly cause a hit to certain industries, given that we are a nation of consumers, often going into debt to consume more and more. However, the flip side of that is if we were only buying what we were going to immediately use, we would all have more wealth building up to spend, so perhaps it would actually help the economy? Your thoughts? I pretty much only use a kindle for ebooks, despite my hatred of vendor-lockin, DRM and amazon having the ability to do things like delete books and set policies on MY device. But anyway, what i do is only download the free sample for any book that sparks my interest. Since mine is 3G, i can download the full book pretty much anywhere i am, once i read the sample. It would be nice if that was handled a little more transparently by the kindle. Once I read the sample and download the full book, I have to delete the sample (the full should just replace it) and i have to manually find where the sample ended to continue reading. when i open the full book it should already be at the point where the sample left off. I have so many paper books it’s not funny. I have 4 special book cases that are 7 feet tall and 40″ wide, chocked full. Then about 6 standard sized bookcases. The good thing is I haven’t bought a paper book in about 5 years. I can’t seem to part with what i have, but at least I’m not adding to the pile. I wonder if any book sellers have thought of giving a big discount (70-90%) on ebooks if you turned in an existing paper copy of the same book at one of their brick and mortar stores? It’s great to know that I’m not the only book hoarder around. That’s one of the things that bug me about the Kindle too. Why doesn’t the sample just doesn’t disappear when you buy the whole book??? And I’ve always wondered if book sellers would offer a trade in plan for physical books for ebooks. I think some people will always want physical books and as they become rarer they value will go up. I wish libraries always held onto books no matter how uncirculated they became became it would be nice to have a dependable place to store physical books. I’d give my physical collection to the library to manage. I suffer from the same “consumption/collection” as the rest of you. And not just with regards to books, but also boardgames and videogames. Now i’ve been trying to sell/trade some boardgames and give away some paperbacks i have left. With regards to books I have put myself on a buying moratorium. I have to read 5 i already own and then i am allowed buy 1. Until i only buy what i read. Like someone else said, when you spend more time on amazon looking at bargains instead of actually doing the reading/playing i think there is a problem. Although it’s fun to do it, it should be more controlled as i think we are then missing the point. That’s a very practical solution – getting to buy one book after reading five.